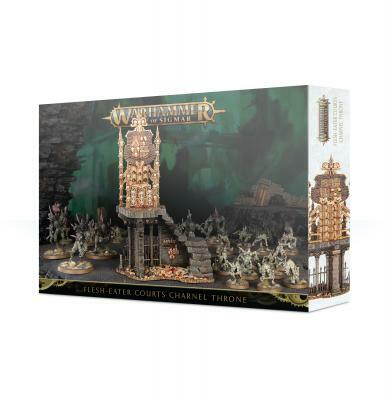 The Charnel Throne is a terrain feature available to all Flesh-eater Courts armies. Costing no matched play points, it’ll inspire your own units, increasing their bravery, while reducing that of nearby foes. Abhorrant Archregents, meanwhile, can use the power of the throne to summon even more units to the battlefield. This set contains one Charnel Throne terrain piece, supplied in 14 plastic components.